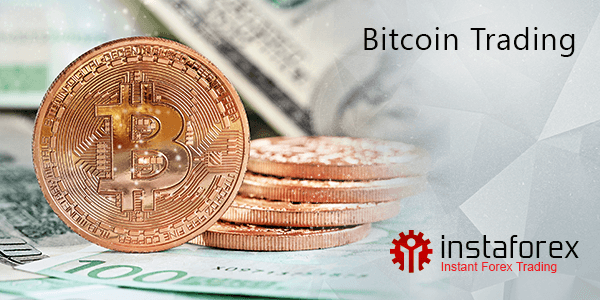 InstaForex has introduced a new trading instrument for its customers – bitcoins. Bitcoins are a unique electronic currency. In fact, these are e-gold coins that can be immediately transferred online, and all the transactions are public and traceable. Therefore, the transparent Bitcoin system enables its users to make transfers without applying to a bank or an exchange. No tedious registration and scanning documents any more – a Bitcoin account takes just one click to open. Moreover, the Bitcoin system is based on an open-source cryptographic protocol, and cracking the encryption is next to impossible. Bitcoins are decentralized digital money, so there is no sole owner. The system is run on servers scattered around the globe and belonging to various people. It makes Bitсoin immune to any adverse factors as well as inflation. Besides, bitcoins are increasingly popular worldwide; therefore the trader appetite for this instrument is intensifying. So, let’s see what advantages Bitcoin offers to InstaForex clients. First, you can use Bitcoin to both deposit funds into your trading accounts and withdraw the money. Second, InstaForex clients now have a new instrument to trade – BTCUSD (#Bitcoin). The trades are conducted in a CFD mode without physical delivery, so profit is derived from the fluctuations of the most progressive currency to date.